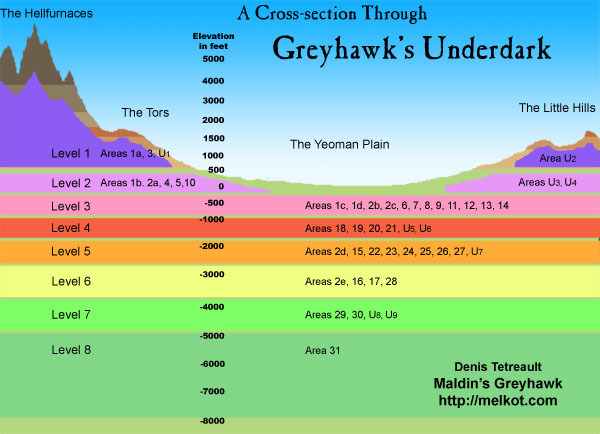 Deep beneath many regions of the World of Greyhawk is an underground world beyond imagination. Greyhawk's Underdark, often called "DeepOerth" is vast indeed, and filled with nightmarish dangers and incredible treasures alike. The Underdark consists of large, relatively isolated regional "provinces", each province in turn consisting of a large number of multilevel, interconnected areas of cavern complexes. The region described here underlies the Yeomanry, the Hold of the Sea Princes, the Hool Marsh, the Dreadwood Forest, the Tors, Little Hills, and the Hellfurnaces, and is typical of these underdark "provinces" in scope. It is known that many of these provinces are connected to each other by long, deep, and very dangerous subterranean routes that are very difficult to find. It is rumored that all of Greyhawk's underdark provinces are connected, and that one could travel completely around the Oerth without ever seeing the light of day, however there is insufficient evidence to support this theory. It would be a truly epic quest to attempt this amazing feat. Below you will find a map of this particular region of the underdark, however because of the underdark's 3-dimensional nature, it is a difficult to see all of the lower levels. The pdf version of a higher resolution map has each level as a layer that can be turned on and off individually (when using a reasonably up-to-date version of Acrobat Reader) enabling one to see each level clearly. Each color-coded level represents a zone of the Oerth's crust between 500 to 1000 ft thick, although some levels have rooms with roofs high enough to actually reach up into the next higher level. In these cases, the regions are color-coded according to the height of the average floor or primary entrance. The deepest level shown here (Level 8) is much thicker than the overlying levels, with a ceiling that sometimes arches 1000 feet above a sea that reaches depths of 2000 feet. Being within the highland areas, Level 1 is at approximately the same elevation as the surrounding plains. The remaining levels reach down an incredible 5000 to 8000 feet below the surface of Oerth. While some of the numbered regions (or "rooms") actually do represent a single large cavern (such as the Sunless Sea - both of them! ), most of the areas represented on the map as a single numbered area (or several) actually represent a complex of many tunnels and rooms (sometimes hundreds!) that penetrate the indicated area like the holes in Swiss cheese. The timing of the release of this special pdf and webpage was done in concert with a special edition of mortellan's wonderful World of Greyhawk webcomic. The Lords of Evil have a problem, the whole underdark is threatened, and someone is using my map in their report on the crisis. Check it out! The map locations in Greyhawk's underdark can be divided into 3 regions (and 3 sources). Location 1 is described in the D Series of modules, and Location 2 comes from the Night Below boxed set. More on those two areas in a moment. All of the remaining location names and numbers are keyed to the locations described in the 1st Edition AD&D hardcover "Dungeoneer's Survival Guide" (the DSG). I've always believed the DSG to be a very under-rated book. While it does not contain drop-in-ready adventure material that DMs can use directly, it is filled with great ideas for DMs who enjoy developing their own campaign, and who are looking for a rich source of detail that will help them bring their underdark campaigns to life. As a development tool, the DSG is a treasurehouse, and its footprint can be seen in the writings of many authors that have penned underdark-related adventures and sourcebooks since its publishing in 1986. 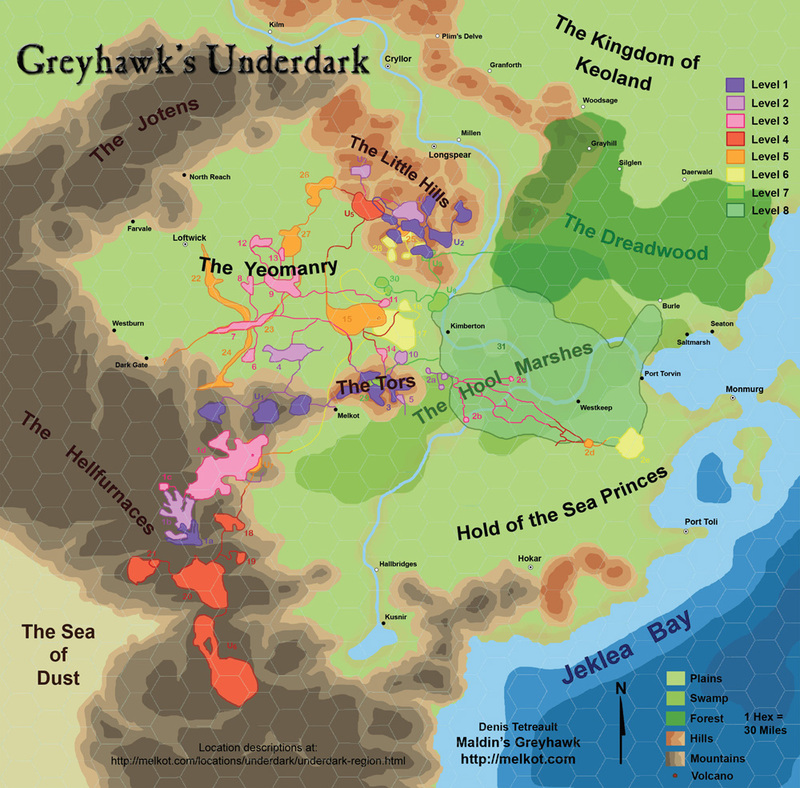 Of particular interest to this webpage, over a quarter of the book is dedicated to presenting a richly detailed example of a large underdark region, a description that I decided to adopt (with changes to the map layout, and to some of the area details to fit with the new layout) as the underdark of my World of Greyhawk campaign. Below I have short descriptions of the various areas based on the information presented within the DSG, however if you are lucky enough to own a copy of the DSG (or are interested enough to go looking for a used copy) you can find more detail about each area by looking up the named and numbered areas. Within the DSG you will also find descriptions of the various terms used here (such as "living cave", which refers to a cave with plentiful water, whose cave formations - stalactites, stalagmites - are still growing). This is the region detailed by the classic D Series of AD&D modules, later recompiled into the "Queen of Spiders" supermodule, and most recently fleshed out in the Dragonsfoot community Collaborative Project: Mapping the Depths of the Earth. The latest compilation of the current state of the project (entitled "Encyclopedia Subterranica") can be downloaded here. The entire region is a complicated maze of tunnels and caverns of varying size. This region was first detailed in the module D1 Descent into the Depths of the Earth. It represents a series of long tunnels connecting smaller caverns and other features, and contains a drow outpost, a colony of troglodytes, and a variety of other typical subterranean creatures such as trolls, bugbears, and wererats. Deeper in drow territory, and detailed in the module D2 Shrine of the Kuo-Toa, this region is a similar complex of long, interconnected passageways and small caverns. As well, there lies a city of the fish-men, who have an uneasy truce with the drow. Within this region can also be found the ancient city of Khor. The Vault (detailed in the module D3 Vault of the Drow) is a huge cavern approximately 6miles by 5miles, with an arching ceiling up to several thousand feet above the floor. Unless one has visual enhancements described in the adventure, beings with normal vision can see clearly out to 40 yards, and faintly out to 80 yards because of a very dim light that fills the cavern from a huge mass of tumkeoite in the ceiling. The floor of the cavern has quite extensive fungus forests and open plains. A road crosses the floor of the cavern, past a number of drow manors, and up to a massive wall with a large gate. Behind the gate lies the capital city of the drow in this part of the world, the city of Erelhei-Cinlu. Almost 10,000 drow live in the city. A river winds across the northern part of the cavern, flowing to the east. Hinted at in the original map from D3 The Vault of the Drow, the Sunless Sea is a huge underground body of water. This region of Greyhawk's underdark is detailed in Carl Sargent's wonderful boxed set Night Below: An Underdark Campaign. Designed to be fit into any campaign world, DM's who wish to use it in their World of Greyhawk should find that its placement here is particularly parsimonious, as many Greyhawk community sages tend to agree. The entry point for this region of the underdark, the Upper Caverns are occupied by orcs and other minions of the greater evil that lies deep below. Lesser underground creatures crawl through the area. Possible entrances to the surface include the dark reaches of an orc cave, the depths of an abandoned mine, and a hidden passage below an abandoned keep occupied by bandits. The caverns leading through this area are occupied by a number of noteworthy reptiles, including an ancient behir and a shadow dragon. Beyond is the powerfully warded domain of the rockseer elves, particularly secretive beings difficult to win the trust of. The city-maze of the svirfneblin dominates this portion of the caverns. Also in the area is a svirfneblin burial ground, hidden by hallucinatory terrain, as well as a colony of trolls. If adventurers prove themselves, the deep gnomes are ameniable to helping them out and describing some of the dangers of the area. The City of the Glass Pool is home to an alliance of illithids and kuo-toa. Together with their derro and Ixzan minions, they control this entire region. They themselves are in turn the minions of an even more evil and alien group, the aboleth from the Sunless Sea. Not to be confused with the Sunless Sea of the D1-3 Series, this is a huge cavern some 30 miles across mostly occupied by a vast body of water. The ceiling height averages about 400 feet above the surface of the water, and the water itself reaches depths of up to 800 feet. Along the northwest and southeast edges of the cavern are wide areas of dry land. Dim light from phosphorescent algae in the water, and fungus on the walls and ceiling, fills the cavern with the equivalent of pale moonlight. The undisputed rulers of the cavern are the aboleth, most of which live in their city of Shaboath. Other groups with a presence in the cavern are Ixzan, illithids (including a renegade group that might be open to cooperation), derro, fire giants, and undead. It is quite likely that there is a secret, unmapped tunnel that connects the Sunless Sea to Area 31, the Darksea, which is also rumored to be inhabited by the aboleth. The locations that follow correspond to those detailed in the Dungeoneers Survival Guide, and use the same name and numbering system therein. Within that tome, DM's will find much more detail on each of the regions than the summaries of that information that I can provide here. Some of the area descriptions have been modified to fit my new map layout, and the larger scale I use for my underdark region. Areas on the map designated "U1-9" are undeveloped and open to any detailing DM's wish to do on their own. Check back again later for updates to this webpage as I finish summaries of the missing descriptions I haven't had time to complete (use the version number at the top, and "last modified" date at the bottom of the page). Beneath the Tors is a vast maze-like network of winding limestone caves. These caves are living caves, with plentiful water, cliffs, chasms, constricting passages, and pools of water. Some locations have had dungeon-type excavations. Most rooms are under 20 feet wide, 10 feet high, and 100 feet long, ending in pinched-off tunnels as narrow as 3 by 2 feet in section, or less. Surface caverns often lead directly into this cavern network, and some connect to dwarven mine shafts. Because of its ease of access to the surface, many of the creatures inhabiting these caves like to leave their lairs to raid on the surface, often occupying a small section of cavern with an excavated area of dungeon corridors and rooms. Among the races holding parts of this area are troglodytes, goblins, hobgoblins, ogres, trolls, and lycanthropes. A large number of unintelligent monsters also roam through this area, including giant rats, bats, carrion crawlers, and other scavengers, as well as a few potent individual monsters such as a gibbering mouther, greater basilisk, shambling mound, and beholder. This series of living caverns is made up of 4 very large limestone caves running through the area, and varying in length from one to six miles long, connected together and to lesser chambers by narrower passages. Each of the large caverns have ceilings up to 100 feet high, and a few places where it is up to 80 or 90 feet wide. These caverns are filled with spectacular stalactites, stalagmites and draperies, giving the appearance of a wonderously ornate cathedral. There are several connections to the surface world, however they are few and well concealed, so most of the denizens of this region do not depend on access to the surface. In one area there is a narrow tunnel, laboriously excavated in the forgotten past, that rises up to a long-abandoned dungeon complex beneath the ruins of a castle. In another location, a sinkhole within a region of forest plunges 400 feet down to the floor of a side-cavern. The side cavern is partially sealed off from the main cave by a rock-fall. A few hours of excavation would clear a path large enough to allow humans to pass. One of the side caverns is occupied by an isolated group of evil and suspicious drow, even by drow standards. They know the local caverns intimately, are expert at underground combat, and would prove difficult adversaries. The vicinity of their home is heavily trapped on all approaches. One of the central cathedral chambers is infested by piercers. Oozes and jellies are relatively common, as are the pervasive rodents, and every kind of bat imaginable. Years ago, a large hydra suffered the misfortune of falling down the sinkhole, and has managed to survive in the area ever since. These natural caverns are filled with air, however the only entrance and exit are completely filled with water. Water flowing from the Hool Marshes into a cave entrance meanders several miles through a tunnel with a high ceiling, eventually reaching a point where the tunnel widens enough to allow a wide, sandy beach. Evidence of numerous camps litter the beach. From here, the relatively placid river continues on for several more miles, begins to pick up speed and tumbles along as rapids. Abruptly, the current increases to cascade level, and pours through a hole just wide enough for the rapid flow. With no airspace, boats capside, masts and tillers get crushed by the enclosing walls and ceiling, and drowning often ends the lives of any passengers. Many valuables litter the river bottom here, spilled from boats as they break apart. A search would reveal a large number of coins, all sorts of mundane armor and weaponry, and even a few magical ones. Several rounds later, the river empties into a quiet pool in a vast cavern. The river meanders through the main cave, eventually plunging through another water-filled opening at the far end. From there, the underground river flows through a series of narrow tunnels and minor caverns beneath area 3, eventually plunging over a tremendous 500 foot waterfall into Area 14. The entry cavern connects to eight other caves, each less then a mile long, through very narrow passages. The most pathetic of several groups of inhabitants is a band of humans, all the pitiful survivors of a dozen previous (doomed) expeditions. Their boats were wrecked in the entry tunnel, and they elected to remain rather than attempt to float out the far end. Over the years, several have attempted to leave with promises to return and rescue the others, but none have ever returned. Approximately 20 (mostly men) live off of fungi and an occasional fish, and are armed with a ragged collection of weapons. Most have gone quite mad. The dreaded nemesis of the humans is a small outpost of kuo-toa, who periodically sweep through the caverns in search of food and slaves. This relatively simple series of caves shows considerable evidence of excavation and decoration. There is but a single tunnel leading to this area, and it has been smoothed and widened to a uniform width of 30 feet and height of 10 feet. The corridor leads to a huge domed chamber nearly a half mile in diameter supported by massive stone columns. In the center of the chamber is a large, elaborate temple carved with bestial shapes, surrounded by concentric rings of two- and three-story buildings. Carved into the outer wall of the cavern is a ring of crude stone barracks. At 60-degree intervals around the main chamber radiate 5 tunnels that end in smaller caverns. Once serving as fungus farmlands and livestock pens, these are now dry and dusty. Opposite the entry tunnel in the main chamber stands a 100 foot tall, 600 foot wide columned palace with huge brass doors. This was originally a thriving duergar city, however shifts in the water table resulted in a devastating drought that continues to this day, forcing the entire community to relocate. The duergar stripped everything of value when they left. The air is stale and smells faintly of decay, and of such poor quality that characters exerting themselves for more than 2d6 rounds will find that they must stop and gasp for breath for 1d6 rounds. There is no longer a single living creature here, yet the palace is not unoccupied. Therein, hundreds of undead stand guard to protect the hallowed ground. Zombies, skeletons, and mummified leaders will attack if the palace doors are opened, and pursue intruders until the beginning of the entry tunnel at Area 7. In a secret chamber beneath the palace is the royal smithy, where there lies a massive black anvil that radiates strong magic. This is the forge of power of the duergar. It weighs 2,500 pounds, and cannot be moved without destroying its magic. Any weapons or armor hammered into shape on this anvil gains an enchantment bonus of +1. If a hammer of substance is wielded by a properly trained dwarven or duergar smith, weapons of +2 or +3 can be created. This yawning underground chasm stretches for nearly 60 miles length and is fully a mile wide.The arching ceiling has withstood many earthquakes and natural disasters, and ranges between 200 and 500 feet higher than the level of the entry tunnel. The walls come gradually closer as one goes deeper into the chasm, meeting in a bolder and rubble filled gorge over a mile below. Carved from the earth by a once mighty river, the river flows no more, and may be related to the hydrogeologic changes that forced the duergar to abandon their city in Area 6. The walls are cracked and riddled with ledges, chimneys, side caverns, and other irrregularities. The chasm is too wide at this level to be spanned by any bridges. Across the canyon from the access tunnel to Area 6, is another large cavern penetrating the chasm wall, leading eventually to Area 8. About 3000 feet below this level is another series of caverns that penetrate both sides, however these are several miles to the west, and thus climbers descending straight down from this level do not find the lower caverns. Mobats, cave fishers, giant centipeds, and carrion crawlers are all common here. Giant slugs scour the bottom of the great chasm. There are several small cloaker communities along the great length of the chasm. Water is not readily available, although there are some seeps near the top, and stagnant pools at the bottom, the latter often being contaminated with disease. Connected to the Grand Canyon by a long access tunnel, this region is riddled with many large, relatively open caverns joined by relatively broad tunnels to form a maze. The caves have few speleothems, and in some rooms, even these have been removed. The floors are lined with a deep layer of soft loam, from which grow thick carpets of fungi. Virtually every type of underdark mushroom can be found somewhere in these forested rooms, from shriekers and violet fungi, to a host of edible species. Within some of the rooms, the fungi have been carefully tended and cross-bred so that they grow to extreme heights, towering up to 30 feet. Within a large central chamber is a community of myconids, the caretakers of the tended fungus caves. They protect and irrigate the forests around the nearby caverns. More distant ones are noticably wilder, and potentially more dangerous. The community is led by a very old fungus king, who has animated a number of guardian zombies with his animator spores. A key section of DeepOerth because it connects to so many other areas, the Caverns of Doom are a vast network of natural caves and connecting tunnels. Some of the rooms approach 1000 feet in width, 2d6 miles long, and hundreds of feet high. Mostly dead caverns, there is little flowing water here, although streams can be found. A dangerous route rife with obstacles such as pits, chasms, and cliffs connects to the surface, however tunnels connecting to other regions of the underdark tend to have much fewer obstructions. The Caverns of Doom were so named by adventurers who penetrated this far and returned to the surface to tell of its terrors, thinking they had reached the lowermost depths of the underdark. The jermalaine are the most common creatures here, although other caverns contain pockets of drow, duergar, pech, and most of the more common unintelligent underdark denizens. Creatures such as giant toads, stirges, piercers, spiders of all types, jellies, puddings, molds, rust monsters, cockatrices, gargoyles, wraiths, wights and various fungi all can possibly end the lives of inexperienced cave explorers. Areas of interest include a secret diamond mine operated by the pech, and a fortified area around the duergars' water supply. This area was land once on the surface, however a massive earthquake some time in the distant past, perhaps the same one that changed the flow of water throught the underdark beneath the Yeomanry, and perhaps the tectonics that may have contributed to the formation of the Hool Marsh, dropped the land below the surface. As the thick forest and many small villages plunged into the depths, the sides of the massive fault blocks toppled inward, crushing most of the unfortunate victims of the quake. In a few places, however, the massive faces of rock wedged against each other, leaving vast hollow spaces below them. Miraculously, within these spaces, humans and animals survived. Over a dozen huge chambers 1,000 to 4,000 feet wide and 3d6 miles long are scattered about this region, connected by passages that appear to be dug by hand. Unlike most areas of the underdark, these caverns are floored by thick layers of dirt, made spongy by the long-since-rotted forests of the surface. Fine mists falling from the overhead fault lines keep these caves quite damp, slimy mosses and fungi growing on surfaces (and glowing enough to provide a dim light source). The humans who survived the earthquake continue to try to exist in their dark, dank environment but have degenerated down to pathetic, filthy, naked savages barely able to communicate who sometimes resort to cannabalism. Groups from different caverns compete against each other for resources, and sometimes go to war. Other creatures that call the Sunken Swamp home are shambling mounds, monstrous toads and frogs, snakes and spiders, and most varieties of underground scavengers. None of the original surface buildings have survived the pervasive rot, except rare stone buildings scattered about the caves. One is the ruin of a particularly large temple, which the locals refuse to enter, deeming it "sacred ground". In all cases, the timbers supporting the roofs of buildings have rotted away long ago, leaving all ruins as mostly just walls. This isolated region is only accessible by way of a very long stretch of caverns connecting to Area 9. A series of narrow, mile-long side chambers surround a single large chamber nearly a mile in diameter. Enough water flows through these caverns to ensure that they are "living" caverns, with plenty of speleothems. The roof of the large central chamber is supported by a massive pillars clearly constructed by earlier residents. At the center of the chamber there is a small pond surrounding a grouping of ancient stone buildings constructed by an earlier population of dwarves. The buildings are now occupied by a group of illithids. Other creatures inhabiting the side chambers include the usual assortment of scavengers, such as carrion crawlers, otyughs, rats (normal and giant), slimes, jellies, and oozes. Some of these creatures survive on carcasses left behind by the mind flayers. A group of highly interconnected and irregularly shaped caverns surround a vast central cavern over three miles wide by four miles long. Created during the cataclysmic regional earthquake so long ago, massive blocks remained in place to support the chamber roof, while surrounding blocks collapsed into the Oerth producing the vast open space. None of the blocks are at the same elevation, so the cavern floor is multileveled and split by numerous gorges, chasms, and cliffs every couple of hundred feet, producing a treacherous and bizarre landscape. Water commonly flows down the sides of blocks as waterfalls. Communities of jermalaine and pech inhabit the area, and are at constant war. Outnumbered by the jermalaine by 10 to 1, but much more organized, the pech are here because of variety of natural resources that were exposed by the faulting - iron, lead and gold, in addition to small deposits of jade and onyx. The pech have created a haphazard series of pathways, ramps, and bridges over the broken landscape, however many of these are trapped. The pech have also created numerous well-concealed treasure caches around the cavern. This section is a maze of interconnecting dead caverns, some quite narrow. There is no flowing water here, and dust covers everything. The only life here are thousands of bats who roost here, yet get their food elsewhere, and the creatures that feed on the bats or their droppings. Notable bat-predators here include a few basilisks, and swarms of scavenging carnivorous beetles that crawl about on the floor. There are only two ways into this area. The first is along the river flowing from Area 5, which plunges over 500 feet as a great waterfall deep below the Tors, before flowing more placidly from its deep plunge pool along a nearly flooded cavern with just 6 feet of airspace above water level into Area 14. The second is the long, sometimes flooded river-tunnel that flows towards area 15. Once almost completely filled with water, these caverns have been reclaimed by the persistent hard work of the pech, who maintain a community of at least 300 industrious miners. Because the caverns have been flooded for much of their history, there are no cave formations, but rather rooms and tunnels tend to have very smooth surfaces, carved by the flow of water. The pech have used heroically created walls of stone to create dikes that direct the river's flow towards the outlet, and preventing them from reflooding the interconnected side caverns. At the site of a bridge that crosses the river, the pech have created a unique centrifugal pump powered by a giant water wheel, that pumps water up into the river that has been collected from tunnels many miles long that connect to drains they have created in several of the lower side chambers. All of this effort enables the pech to mine rich iron and copper deposits, even operating a large smelter that is also ventilated by the giant water wheel. Creatures seen in these caves include marine trolls (scrags), shambling mounds, a gibbering mouther, cave crickets, many types of leeches, ropers, among others. This area is also subject to raids by the kuo-toa that live in area 15, who come to sabotage the efforts of the pech by damaging dikes or attempting to divert the river to flood the caverns. This immense area is mainly occupied by a single open, subterranean chamber that is almost completely water-filled. Everywhere, walls and columns support the ceiling, preventing this large open area from collapsing. The ceiling is not particularly high, usually no more than 10 to 20 feet above water level, and in some areas it drops down to, or below, water level, however boat travel is possible over most of the lake. There are relatively few places where there is a shoreline for boats to land. The lake's depth varies from 10 to 100 feet, not a lot for an underground body of water with such a large surface area (almost 30 by 45 miles across). This has occurred because the chamber represents the dissolution of a relatively thin and horizontal, yet very laterally extensive rock formation. Hence, the same type of limestone can be seen in the walls and ceiling of the entire chamber. In the eastern depths of the lake, a small hole allows water from the lake to drain into a lower cavern (Area 17). Several tunnels lead to this region of the underdark. The entrance to one such tunnel has a small shoreline with a number of ancient stone piers. This path leads to a major intersection of tunnels that eventually reach out to Areas 3, 4, 7, and 9. An underground river flows from Area 14 into the underground lake. Another long tunnel leads north to an undescribed region of caverns. The foolish could also attempt to pass through the lake's underwater drain. The lake may appear to be placid, however it is teeming with life. Blind cave fish of all varieties scurry away from giant catfish, giant pike, giant gar, lamprey, and other numerous varieties of fish, as well as water nagas, giant otters, giant crabs, giant snapping turtles, scrags, and lacedons. The undisputed rulers of the lake, however, are the kuo-toa, who have a six-domed city near the drain, each dome approximately 150 feet in diameter and 50 feet high. Inside the domes are elaborate networks of rooms, corridors and flooded vertical shafts. The kuo-toa use large boulders to regulate the flow of water through the drain, ensuring that water flows out at the proper rate to maintain a stable water level for the lake. Long ago, a second underground river flowed through the underdark, joining with the river from Area 14 on its way into the Upper Lake (Area 15). At some point in the past, a large portion of its cavern collapsed, diverting the flow elsewhere, leaving a long dry tunnel. Explorers hiking the many miles up the tunnel from the still-flowing river eventually reach the massive plug of collapsed rock. A few miles before the collapse is a side chamber where one finds one of the most impressive, and unsettling, constructions in this part of the underdark. From this point, a long spiral stairway descends a full 1,333 feet into the depths of the Oerth. The each stair of the carefully engineered structure is 10 feet wide, one foot deep, and drops eight inches. All with such meticulous precision that there are exactly 2000 steps, if one were to try counting them. A hollow, 10 foot diameter shaft plummets straight down the middle of the perfectly vertical stairway. There is no guardrail. At the bottom of the staircase is a series of rooms filled with spectacular draperies and other extensive cave formations, some of the most impressive in the underdark. Some of the rooms have small pools of clear water, never more then 50 feet in diameter and 20 to 30 feet deep. From here, a natural cavern descends steeply, averaging 20 feet in width and 10 to 20 feet in height. A small stream splashes through its length, and over the many drop-offs and cliffs (1d6x10 feet high) on the way down. The cliff faces are rough and cracked, with many ledges, so climbing down is not difficult. There are places where a relevantly-trained eye can see steps carved into the cliffs, however uncounted centuries of erosion, dissolution, and minor rock slides have all but removed their traces. Eventually the cavern levels out, just before opening up into Area 17. Despite the carefully constructed, and vey ancient stairway, no intelligent, organized creatures call this area home, although many may pass through (such as pech, jermalaine, derro and drow). The large caves at the bottom of the staircase contain a number of mimics and a greater basilisk, while the smaller surrounding caves contain bowlers, trappers, zorn, piercers, rock reptiles, scum creepers, and in one location, mud men. This huge cavern, approximately 30 miles across, is nearly filled with water averaging 500 feet deep, and a ceiling height of approximately 100 feet above water level. In the western part of the lake, a roaring column of water drops, from the drain in the Upper Lake (Area 15) through the ceiling of the Lower Lake to the lake surface, creating quite a bit of turbulence. The rest of the Lower Lake is quite placid. The walls of the cavern are quite vertical, and there is no accessible shore. The tunnel leading from Area 16 meets this cavern 50 feet above water level. There are numerous, although widely separated and mostly-flooded side caverns, however all of their entrances are at least 100 feet below lake level. To the northwest, a broad 100 foot-wide river lazily flows from the lake and meanders through a wide cavern towards Area 30. Its depth averages 1d10+10 feet. The only other exit from this area can be found behind a rather unremarkable hollow high up the cliff face in the south west part of lake. A series of small, narrow, interconnected caves leads to a string of incredibly long, unknown tunnels that eventually lead all the way back to the Hellfurnaces, 250 miles away! This vast water body is the scene of a bitter struggle between the aboleth and the kuo-toa. Each race maintains outposts in the lake, and battles often rage both on its surface and in its depths. The kuo-toa have a domed city near the eastern end of the lake, near the tunnel to the Upper Lake, and often travel by that route to and from their city there. Individuals on an urgent mission may use the drain, however its great danger and nearness to the aboleth outpost make those events rather rare. The aboleth have a city near the lake's western end, and attempt to control access to the river. The lake is also inhabited by a number of waterborne fungi and numerous fish. The only creature here feared by both the aboleth and the kuo-toa is a massive kraken who lairs in one of the large side caverns. The only mineral wealth in the lake lies directly beneath the thundering column of water from the drain, where a vast amount of gold in the form of tiny flakes and gold dust has settled. Collecting it in 500 foot deep water that is patrolled by aboleth, kuo-toa, and a kraken would prove difficult. Large amounts of water, mainly from the Sunless Sea (Area 1d) to the north carved out this region interconnecting caverns, however tectonic upheavals faulted and fractured the rocks, causing much of the water here to drain deeper into the Oerth and interact with deep volcanism. A river from Area U7 carries water draining from the Sunless Sea south and into this area where it gets heated by the merging of a stream originating from a side cavern with a hot geothermal spring. The course of the hot stream has been artificially altered to increase its ability to carry more water and move it faster. Many of the caverns contain pools of water of varying size and depth, each with a 20% probability that it is a geyser that can at any time violently expel scalding hot water causing 6d6 points of damage (save vs. breath weapon for half). Cracks and niches in the rocks also can issue deadly blasts of steam for the same damage. Temperatures get hotter the farther south one travels. The rocks in these caves tend to be consistly wet and slimey with mildew and mold. The muggy heat causes characters not used to the conditions to tire in half the usual time. Heat- and fire-loving creatures can be found in these caverns, including efreet, fire elementals, salamanders, and fire bats, however they tend to be visitors from the south, and are therefore more likely to run then stand their ground if things get difficult for them. Other creatures such as hell hounds, giant rats, green slime, carrion crawlers, and even megalo centipedes lair here, so are more likely to fight to the death. The most dangerous inhabitants are a clan of fire giants, who often travel with their pet hell hounds. Also originally formed by water, these caverns sit directly above a very hot magma body. The temperatures are so blisteringly hot that any water is quickly evaporated, and the cave-forming streams dried up long ago. The approach tunnel is so hot that any creatures not resistant to heat sustain 1d6 points of damage per turn unless they constantly douse themselves with water. The large caverns themselves are roughly circular, connected by artificial and natural tunnels, and are each split by long, narrow (3d6 feet wide) fissures in the floor. Each fissure has a 50% chance of being bridged by a slender stone arch. These fissures are thousands of feet deep, and belch out blistering clouds of smoke, poisonous gas, steam, and fire (25% chance for each type) on average of once per hour in each cavern and lasting for 1d6 rounds. Non-resistant creatures take 1d6 points of damage every round here, and if caught in an eruption, will take 6d6 points of damage per round (save vs. breath weapon for half). Not surprisingly, the creatures found here are special indeed. Mephits are present (fire, lava, smoke, and steam), as well as fire bats and magmen. The largest fissure occurs in the most remote cavern. There, upon each eruption, 1d20+20 mephits enter the cavern from the 20 foot-wide fissure and aggressively toil to widen it by chipping away at the walls with an assortment of superhardened, heat-impervious metal tools. These tools resemble small pickaxes with stone handles and metal picks, and a number of which can be found lying about the cavern. The mephits will cheerfully attack any creatures they find, but do not kill them. Rather, they are dragged to the fissure and thrown in as offerings. They have spent many years attempting to widen the fissure to allow the passage of some monstrously evil creature from the lower planes, and will continue to do so until they achieve their goal (or a major catastrophe seals the fissure). The approach tunnel to this area is very hot, and causes the same heat damage as described for the approach to Area 19. As characters enter the Lava Caves, they will see a large cavern shaped much like a balcony overlooking a vast amphitheatre of fire and molten rock. Inside these caves, damage is similar to Area19 as well, however eruptions occur about once per week. The cavern is actually a huge natural cave that has been split by cataclysmic geological forces, with the southern half of the cave missing. Standing on the edge, one sees a 400 foot drop-off that overlooks a vast, hellish panorama to the south, illuminated by a dull red glow. The view looks out over miles and miles of molten rock, a sea of magma with an occasional stony crag jutting from the lava like a forlorn island. Here and there, columns of stone rise up to the ceiling, supporting the massive weight of stone averaging over 1000 feet above the lava surface. Every day chunks of the ceiling break free and splash spectularly into the lava. The surface of the lava is tossed by swells, much like an ocean, splashing lava against the rocky cliffs. Great fissures in the ceiling allow heat and smoke to vent up the long distance to the mountainous surface, helping to give the Hellfurnaces their name. Not surprisingly, there is no water to be had in these regions of the underdark. The cavern overlooking the lava sea is guarded by a large outpost of fire giants, who wish to protect one of the few entrances to the fiery underdark from the outside world. The outpost is generally occupied by at least 20 individuals, and some dozen hell hounds. Fire-resistant characters bold enough to venture out into the lava sea will find some of the islands occupied by other groups of fire giants and lava children. Deep within the Lava Caves is a large island that has been tunnelled and carved into a massive castle, and is the seat of the fire giant king. held by the fire giant kingGreat numbers of magmen live in the lava sea itself, splashing through the molten rock like porpoises in the ocean. More dangerous are the magma para-elementals, who will even attack fire giants in their sculpted-granite lava boats. Firebats cling to the ceilings. Other creatures found here are invaders from the elemental vortex in Area 21 who find the lava sea a pleasant place to visit. Fire elementals, efreeti, salamanders, and other allies from the lower planes make occasional forays into the Lava Caves and wage a violent war with the fire giants and lava children, in an attempt to seize control of the area. Spectacular battles with fleets of lava boats and thousands of creatures occur about once every decade. So far the locals have driven off the invaders each time, however each foray has come with a stronger invasion force each time. Navigating the access tunnel to this region, incurs the same damage as the one to Area 19 (1d6 per turn), and can only be accessed by crossing the Lava Sea. The tunnel eventually arrives at a huge cavern over 1,000 feet in diameter and over 300 feet high, where the heat is noticeably much more severe, and non-resistant creatures begin suffering 1d6 points of damage per round. The smooth, flat floor is pierced in the center of the room by a perfectly circular, 100 foot diameter hole, from which red and orange fingers of flame flicker around the edges, occasionally flaring up to reach the cavern's ceiling. The sides swirl in a hypnotic pattern around what appears to be a truly bottomless hole. Anyone staring into the hole for more then a single round must make a Wisdom Check, and if it fails they are compelled to jump into the hole and make a most dangerous journey. Across the cavern, several large tunnels head west. A reddish glow seems to originate from beyond. The tunnels all open onto ledges that overlook another immense magma sea, although from these lookouts it is not apparent that this sea is not as large as Area 20. Flowing magma circulates through large tunnels beneath the vortex room between the two magma seas, however the vortex in the floor is not a pit into the underlying magma. The vortex is a massive gate to the Elemental Plane of Fire. Through it, creatures from that plane can enter the Prime Material Plane without being summoned, and the reverse journey can also be made. The only creatures that will be encountered in the vortex chamber come from the Elemental Plane of Fire. The flames around the margins of the vortex contain 1d6 fire elementals (randomly determined size). They remain in or near the vortex, but will work together to prevent any Prime creatures from entering it. Once a battle begins, there is a 50% chance that 1d6 reinforcements arrive, and may include efreeti, salamanders, azer, fire bats, and elemental grue. Any creatures entering the vortex not completely immune to fire suffer 8d8 points of damage per round. As the physics of the Elemental Plane begins to hold sway here, anything entering the vortex descends as if under a feather fall spell. Levitation or fly (or similar magic) cast within 5 rounds allows a character to reverse their decent and exit the vortex. If not, 10 rounds later the characters find themselves on a massive chunk of matter with an erupting volcano, in the Elemental Plane of Fire. The vortex here appears as a chute leading into the depths of the volcano. Re-entering the vortex, travels may discover that there are actually two connections to the Prime Plane, and have a 50% chance of arriving at the second location. This other exit lies in a chamber approximately 500 feet below the 1st vortex along the magma river where there appears to be a giant whirlpool of magma. This lower vortex is the usual arrival point for the elemental armies during their invasion attempts. The lava sea beyond the side tunnels is a bleak and hellish world indeed. Most of the native inhabitants, so common in Area 20, have been wiped out here by the invading elemental armies, although there are a few isolated groups of fire giant resistance-fighters struggling against the onslaught. Most of the creatures found here will be scouts and small beach head outposts of creatures from the Elemental Plane of fire, including elemental grue, salamanders, efreeti, azer, and wandering fire elementals and fire bats. Numerous long, narrow, natural caverns running side-by-side and above and below each other dominate this region that runs approximately north-south. They comprise at least 3 distinct levels, and average 20 to 30 feet wide, and 10 feet high, however often become much narrower than that. The caverns were originally cut by streams that ran parallel to each other, that over time flowed through progressively lower strata as they emptied into the Grand Canyon of Deepearth. Streams still flow through most of the passages, but never completely fill them. Where water nearly fills the narrower sections, the svirfneblin have created upper passages so that gnome-sized characters never have to get their feet wet. Spiral stairs and ladders connect the various levels at many locations along the caverns. These are small in diameter and a tight squeeze for human-sized characters, however none too small to prevent passage. Along the length of the caverns are numerous small tunnels that serve as homes for the svirfneblin, and range in size from tiny burrows too small for a human to enter, up to large multifamily residences or council centers which humans could crawl into and stand erect once inside. Each of the many primary caves are the neighborhoods of a single clan of deep gnomes, and contain a central council chamber averaging 60 feet in diameter. The largest caverns belong to the most prestigious clans. The clans all cooperate with each other, and have a huge 200-foot diameter clan meeting chamber in a central cave. The total population numbers over 5,000 deep gnomes, and fully 1/3 of this number could be mobilized for combat if the need arose. The larger caves have herds of rothe maintained by the gnomes for their wooly hair and tasty meat. Each clan keeps at least 100 rothe, with the larger clans having as many as 10 times that number. The rothe graze on the fungi that grows throughout the cave system. Tunnels that branch to the north and the east of these caves lead to iron, silver, copper and lead mines, some many miles long. Near the east-central mines is a huge smelter and smithy, where large amounts of coal are burned to stoke the fires. A vast, complex network of vertical shafts connecting to heavily fractured rocks far above these caverns vent the smoke where it dissipates into the porous rock. The svirfneblin smiths create high-quality weapons, armor and tools. Some is used for trading, the rest is stockpiled. The vault where this surplus is stored also contains thousands of bars of silver, and is protected behind magical illusions and a sliding stone door that requires a combined strength of 550 to move. Hundreds of gnomes using complicated winches and pulleys are needed to open it. This is the lower reaches of the Grand Canyon described in Area 7. From here, the ceiling is approximately 3500 feet above the entry tunnels from Areas 22 and 24, and the floor is still another 1000 to 1500 feet down. At this level the Canyon averages around 1000 feet wide. A 20 foot wide, sturdy stone bridge spans the incredible width of the canyon (clearly magical aid was used in its construction), connecting the lands of the deep gnomes and the duergar, where vast galleries capable of holding a thousand or more spectators have been carved into the canyon walls. Below the bridge, and clearly visible from the galleries is a three-dimensional web of stone arches, metal girders, rope ladders, and nets. In this treacherous arena, most conflicts within the two groups, and between the two groups, are resolved. Tragic and costly wars of the past convinced these demi-humans that it was far better to appoint champions to combat each other to the death as representatives, rather than suffer the devastating consequences of all-out war in an environment where survival is already a battle. Of particular interest here, there is a tunnel near the bottom of the western-most reaches of the Grand Canyon leading to the west from this area that leads to the next underdark province, which includes a series of caverns that eventually connect to Slerotin's Passage and the home of the lerara. This large network of over 100 natural caverns is the home of the largest population of gray dwarves, or duergar, in DeepOerth - over 8000 live here. Like the caverns of the svirfneblin, the duergar have carved many connecting tunnels and stairways, excavated extensive living quarters along the sides of the caverns, and have a large central cavern which serves as a main council chamber. There is plenty of fresh flowing water, and some caverns have been dammed up, almost filling completely with water, providing a large supply of water even in times of drought. The duergar maintain herds of rothe, like the svirfneblin. Although treated as second class citizens, there are small communities of derro that are permitted to live in side-caverns in the area. The duergar also have hundreds of demoralized slaves imprisoned in small, poorly-ventilated caverns scattered about their communities, and include humans, goblins, svirfneblin, and drow. A stubborn infestation of giant bats live in niches in the ceilings of many of the caves. In the southern end of their domain, the duergar have extensive mines that extend for miles, where they a workforce of mostly slaves toil to extract iron, copper, and gold. Their smiths produce tools, weapons and armor of the highest quality, and sculptors produce golden works of art of great value. The average residence contains 1d6 x 100 gp worth of small gold statuary, and more important locations such as clan chambers or inns contain scuptures worth 2d6 x 1000 gp. The duergar central council chamber has life-sized statues of prominent historical figures sculpted in solid gold. The duergar also brew a pungent and potent ale from a red fungus. In this area, a half dozen large caverns several miles long, each at least 80 feet high or more, converge on each other and link to a huge, excavated central chamber through much narrower connecting tunnels. This circular chamber contains the feature known simply as "the Windpipe". A large outpost of drow live in the chamber, and patrol the connecting caverns. As the windpipe allows access to their homelands below, these guards are highly motivated and relatively high level, always being a minimum of 4th level, and accompanied by a wizard and a cleric, each of at least 5th level. Despite the drow patrols, the caverns of the area contain a wide variety of creatures, such as doombats, piercers, oozes, jellies, slimes, basidironds, giant rats, and carrion crawlers. Pools of wate are common, although 50% of them have been contaminated by noxious creatures or their droppings. A wide variety of fungi grows wherever there is water. The Windpipe is a 20 foot wide smooth shaft that penetrates through the earth up from the drow lands of Area 28 1000's of feet below this level, past Area 25 and up into a series of continually branching vertical tunnels and then into uncountable cracks that penetrate into large caverns of Area U2. Some of these fissures may even continue further up, eventually venting out onto the surface of the Little Hills. From the chamber in Area 25, one enters the shaft through a door-sized aperture. The Windpipe experiences alternating blasts of air that blow up from the depths for about a turn, rests inactive for about four turns, air roars back down for another turn, then goes inactive again. This pattern constantly repeats, although exact timing varies by as much as 50%. When the air is roaring upwards, a character can step out into the shaft, lay horizontally, and be carried up by the wind. Orienting oneself more vertically increases their speed downwards relative to the velocity of the wind, and one can descend the pipe. The trip from Area 25 to Area 28 takes 5 rounds, and the reverse takes 8 rounds, however timing must be perfect or fatalities occur. The drow here have become quite skilled in using the Windpipe. Travelling up from Area 25 runs the risk of getting wedged into narrowing crevices, and then dropping to your death when the air flow reverses. Intelligence checks are required to slow movement at the proper time to exit the pipe at either exit. Among the large number of caverns in this area are some of the largest chambers in all of DeepOerth, with many over a mile wide, dozens of miles long and ceilings over 1000 feet. Water is present in the form of streams and, in some caverns, small deep lakes. Many of the cavern floors have been cut by wide, deep gorges, and while some of them have been bridged, many of those bridges have collapsed. Excavated tunnels commonly lead off in all directions, and in some places fortifications and even large abandoned cities can be found. Cave formations are everywhere, however they often look damaged and worn. The signs of battle lie everywhere - broken weapons, shattered war machines, and thousands upon thousands of skeletons. Although these caverns were once highly desirable to a wide variety of races, nothing lives here now. Skeletons of drow, duergar, svirfneblin, and derro can be found. Other races that leave no skeletons, such as the pech, cloakers, and illithids, fought here as well and left only weapons and tools. The spirits of these warriors still protect their homes. Wights, wraiths, spectres, ghosts, and skeletons will attack any trespassers. Each of the largest caverns is home to a lich that commands the many undead. The lichs' minions have spent centuries collecting up anything of value and bring it to their master's lair within the abandoned fortifications and cities. The lichs are 20% wizard/priests, and 80% wizards, and are 18th to 27th (17 + 1d10). Unlike some of the adjacent areas, this region consists of uncountable numbers of small caverns interconnected by a maze of both natural and artificial tunnels and caverns. Water is plentiful. Most of the many types of intelligent underdark creatures call these caverns home, with each race holding 1d12 caves. Drow, duergar, pech, derro, cloakers, myconids, umber hulks, kuo-toa, and others all live here. Some trade goes on with other regions, such as the svirfneblin and duergar homelands (Areas 22 and 24), the drow homeland in Area 28 (although travel through the Hallowed Grounds is very dangerous), and others, however much of the energy of the locals is spent on strengthening defense, constructing traps and training for war with the other inhabitants. Many of the races keep rothe and harvest the fungus forests. Water is considered sacred, and is never polluted or poisoned. Most of the once plentiful mineral resources have been exhausted, and so are used frugally. The long history of occupation here has left a incredibly complex legacy of secret passages and connecting tunnels. The center of drow civilization in DeepOerth, this region consists of a large number of large living caves interconnected by many excavated as well as natural caverns and tunnels. The hub of the drow realm is a perfectly circular chamber, a large natural cavern that has been laboriously enlarged and shaped by hand, over a mile in diameter, and a 1000 foot high domed ceiling supported by many massive columns. A vertical shaft in the center of the ceiling gives access to the matriarch's council hall, and is only accessible by flight or levitation. Drow cities, towns, and villages are scattered throughout the hundreds of interconnected caverns, and look nothing like the small excavated chambers of the svirfneblin and duergar. Drow construct buildings on the floors of their caverns, much like surface cities. Water is abundant, and the drow have created several large reservoirs to guarantee their water supply. Wide, placid waterways connect many of the caverns, so boat travel is common. The multi-level, cavern complex is interconnected by a network of elegantly carved tunnels and spiral stairways, and communities often have small versions of the matriarchs' council chamber, allowing access only to 4th level drow or higher (the level at which levitation is gained as a natural ability). Well over 15,000 drow (perhaps closer to 20,000) live in these caverns, far more then the Vault of the Drow, however no single city is here is as large as Erelhei Cinlu. There are several major cities, however the population is generally spread out more throughout the myriad of caverns then the population of Area 1. The drow meticulously maintain the quality of their water sources, and many of the large caverns are devoted to fungus growing. There are also many drow-operated mines in the area, including iron, copper, silver, gold, and occasional small deposits of adamantite and mithril. Drow architecture features soaring columns, elegant buttresses, and huge domes. The buildings are primarily stone, expertly sculpted with smooth, clean lines, and often highlighted with phosphorescent fungi artfully placed around them. Prominent buildings are occasionally embellished with gold and silver ornamentation. These areas are not described in the Dungeoneers Survival Guide, and can be developed as individual DMs see fit. Wolfgang Baur's Kingdom of the Ghouls described in Dungeon Magazine #70 would be best placed in Area U1, although it could also serve in Area U2, or in unmapped areas beneath the Jotens or the northwest Hellfurnaces, if the DM preferred. Visit my active site map to see the entire website at-a-glance, find out whats new, and instantly jump there with just a click.